Years ago, if you’d have told me that an anime was getting a game, I would have immediately scoffed,”It won’t be coming here.” Nowadays though, we see more and more anime titles coming to the West. With that being said, I never expected NIS America to localize Psycho Pass: Mandatory Happiness, especially with it being a visual novel. However, with anime titles and visual novels becoming more and more popular, NIS America did just that. And I’m glad they did. 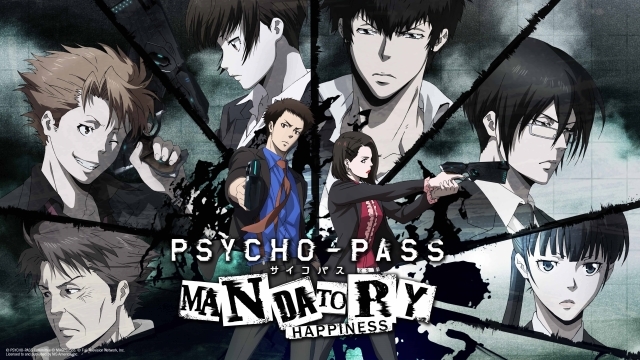 If you aren’t aware, Psycho Pass: Mandatory Happiness is based on the hit anime released back in 2012. However, little knowledge of the series is necessary, as the game does give you a handy database explaining the plethora of terms and characters from the anime. That being said, watching a few episodes wouldn’t hurt, at least to get a feel for some of the members of the Public Safety Bureau (PSB). I’ve only seen the first season of the series, but I was able to follow the plot pretty well. However, a word of warning: a pretty big spoiler from the first season of Psycho-Pass pops up near the end of one of the character’s routes. The game itself takes place early in the timeline of the anime. I don’t think learning said spoiler would completely ruin your experience with the anime or vice versa. Please keep this in mind. The plot follows the members of the PSB as they deal with individuals who are deemed emotionally unstable. The Sibyl System judges citizens based on their Hue, a representation of their feelings narrowed down to a color. Inspectors on the PSB work with people called Enforcers, labeled so due to their high criminal coefficient and can only contribute to society by taking down people such as themselves. The plot thickens as an artificial intelligence plans to make everyone in the world happy, its methods of achieving happiness for everyone conflicting with the Sibyl System. In fact, as evidenced by the subtitle, the main theme of the game is how difficult it is to define happiness, whether it be for one person or for a whole society. Also, the game’s portrayal of a society that stigmatizes and arrests emotionally unstable individuals doesn’t glorify itself but shows how subjective and unethical the system is. Psycho-Pass doesn’t hold back any punches, providing a mature plot that isn’t clearly black and white. The game follows an original storyline with two new protagonists to choose from: Takuma Tsurugi and Nadeshiko Kugatachi. Each character follows the same overall plot, but each character has their own distinctive personality and narration. Takuma, for example, is an upbeat Enforcer, a member of the PSB who works under the Inspectors. On the other hand, Nadeshiko is a very stoic Inspector, a member of the team who gets a lot more freedom in comparison to Enforcers. The distinction plays out through the gameplay, as Nadeshiko is presented a lot more choices on how to handle assignments in comparison to Takuma. It’s a nice touch and fits well with the overall feel of Psycho-Pass’s world. Overall, I’d estimate the game took me 15 to 20 hours to complete, but that is only for one character, excluding trying to follow any additional routes or unlock any multiple endings for that single character. With the difference in perspective and personality, it feels only natural to switch to the other character after you’ve beaten the game once. 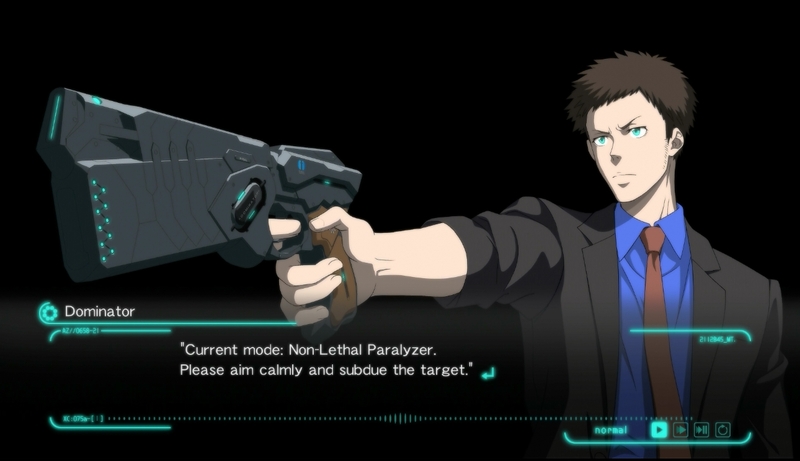 Furthermore, Psycho-Pass fits the visual novel genre like a glove. Many points throughout the game ask you to make decisions, mostly determining the best routes and methods to solving cases. 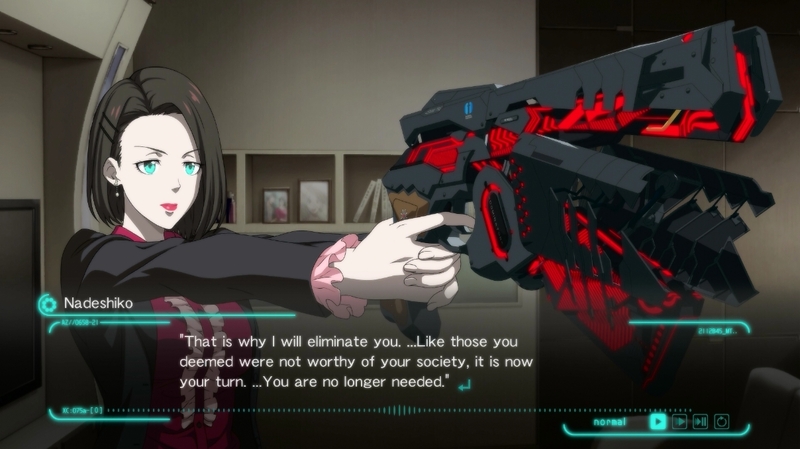 Depending on your decision, though, it can affect your character’s Psycho-Pass, their emotional status that determines whether or not they are fit to perform their jobs. 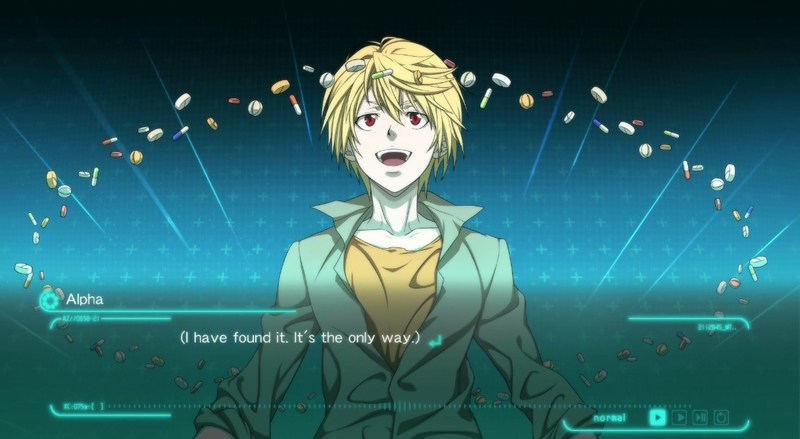 If your Psycho-Pass gets too high, it is possible to take a drug to lower it, though that option only appears at certain times throughout the story. Paying attention to the suspects, their motives, and their history usually pays off with the best decisions, but other times you have to make a gut decision. I experimented choosing different paths on a few missions, and I was surprised how much the story branches. Also, depending on the decisions you make, your relationship with certain characters can increase, though that mostly affects optional phone calls you occasionally receive. 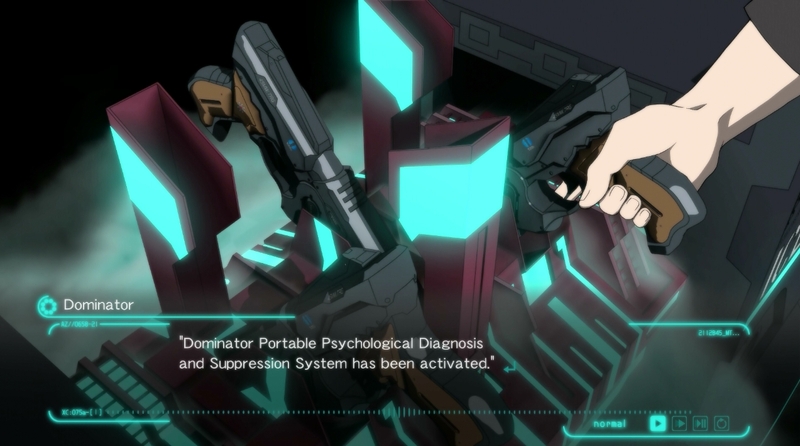 Visually, Psycho Pass: Mandatory Happiness looks like still images from the anime. The sprites are sharp, even when playing on the PlayStation 4 like I did. Also, the character designs appear exactly as they do from the anime. However, some scenes felt as though they were censored, such as a black screen with text describing a gory mess, an artistic decision that may have been chosen on purpose. There are no anime cutscenes to speak of, not even to open the game, which is disappointing but not detrimental. The soundtrack offers several good tracks, many of them fitting scenes perfectly. Action scenes pump your blood with intense beats and sad scenes serenade you with a slow, somber melody. Though Funimation dubbed the anime in English, the voice acting for the game is only in Japanese. For fans of the dub, this may be disappointing, but the Japanese cast does an admirable job. The superb localization by NIS America gives the text character. I may have seen a grammar issue here and there, but the errors were few and far between. It certainly didn’t impede my enjoyment of the game. If you ever need to take a break from the game, hidden within the extras is a really fun puzzle game. Offering a free play mode and stage select, the game could easily stand on its own. At first, it seems pretty simple: each character has a chibi portrait of themselves on a square with a number. Combining that square with the same number creates a new square with a different character on it. On a 4 by 4 grid, you must slide these squares around, combining numbers to get the character the particular mission wants. However, as you play more stages, the game ups the difficulty and throws in new rules to impede your movement. I found it very addictive. Furthermore, playing this game earns you points to unlock artwork and voice clips, so it is a win-win either way. Psycho Pass: Mandatory Happiness isn’t perfect. When loading a save file, sometimes the text on the screen you saved during completely disappears, leaving an empty dialogue box. This issue was frequent, though there were times that I was lucky and the text didn’t disappear. Also, extremely minor, but the database can be a bit too informative too quickly. For example, a key term on the first case spoils the culprit before the team gets to figure it out. Granted, the team comes to the conclusion within five minutes of discussion, but you sit through the entire conversation thinking, “Okay, I already know this, hurry up.” However, that is one of the few times that something like that happens. Furthermore, these issues are easily overlooked to the point where I’m pretty much nitpicking. Anime-based games are usually hit-and-miss, but I admit they are improving. Just look at the latest Attack on Titan game. 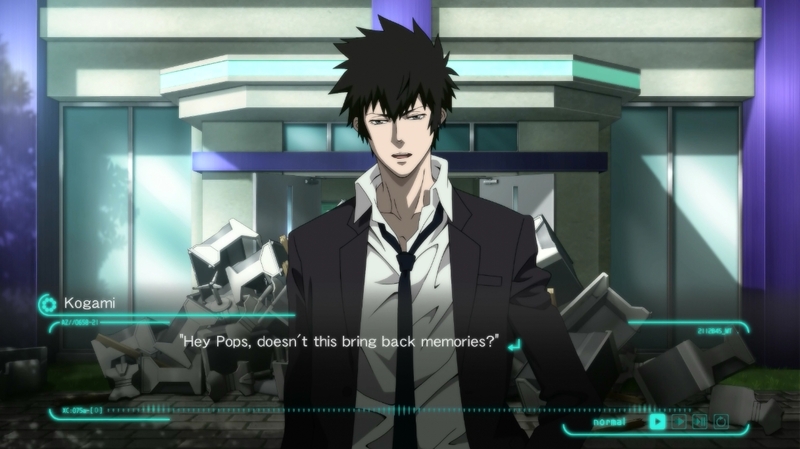 Not only is Psycho Pass: Mandatory Happiness a good example of an anime-based game, it’s also an example of a really good visual novel. The plot is mature and isn’t afraid of taking any risks. Along with the characters from the show, the new characters are charming with their own personalities and point of view. The mini-game alone is enough fun to keep you busy for hours while racking up points to unlock extra content. If this game was simply made to be a marketing tactic for the anime, consider me tricked. With the new partnership between Funimation and Crunchyroll, I feel a binge session in my future.